You may select from furniture grade Oak cherry Maple wood species. All machine work has been completed, mounting holes, and peg holes are all predrilled. Love all the peg rails! They were well made, shipped promptly and fit perfectly in my new home! Peg rack was exactly as described. Easy to paint and put up. I would order from this company again. Exactly what I was looking for! Easy to hang. Great customer service. Love our new entry hook system! Love the look! Easy to hang. Hi Ed, Thanks so much. You do beautiful work. Q: How long are the pegs themselves? Since they're at an angle, how far do they project out from the rail horizontally when it's mounted on the wall? Also, what's the diameter of the pegs? Thanks! The pegs extend straight out 3" from the back rail. The back rail is 3/4 of an inch think, for a total depth of 3.75 inches. The head of the shaker peg is about 7/8 of an inch in diameter. 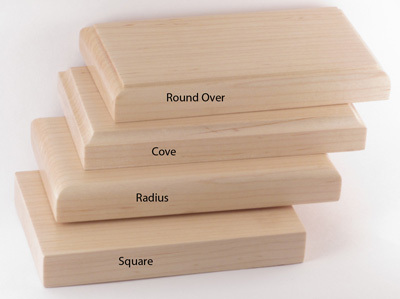 Q: Which type of wood is the best choice for paint? 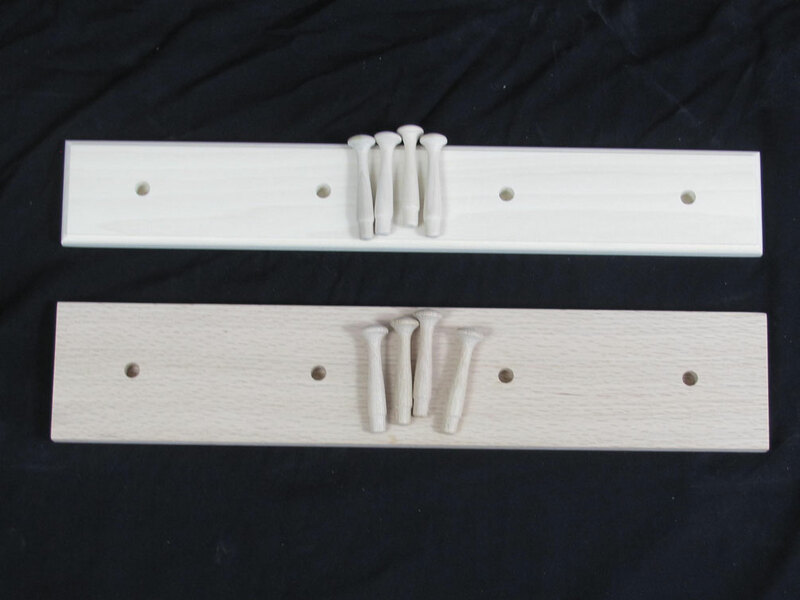 We primarily use Poplar for our painted white products we do use Maple also for painted pieces. The heavy grain in the Oak will leave a texture in your paint, which some like. The Cherry is just to nice to paint it also has some voids in it that would need to be filled. Q: Need to order 8 peg rails of varied sizes. 16" peg rail x 4 (3 pegs) 22 1/4 " x 2 (4 pegs) 21 1/4 " x 2 (4 pegs) 13 1/2 x 1 (2 pegs) All unfinished poplar, 4.5 wide, square edge. Button plug mounting system. Here's the complicated part - we will be mounting these pegs at 90 degree angles to one another - so we need to make sure there is enough clearance for the pegs. For the 16" rails, I will need the pegs to be spaced much less than 6" apart, and rather than centered to the rail, the pegs would need to be rigged more to the right or left. We'd need to 16" to orient to the right, and two to orient to the left. Is this possible? A little confusing, so let me know if I can clarify more. Thanks so much! It sounds like it is just the 16" that need special treatment? If possible just tell me where you want the pegs. or supply a diagram? for example on 2 of the 16" put the first peg at 6" or 7" from the left edge (the corner) the second peg at 10" or 10.5 and the third at 14"
The other two would be the opposite. You may give me a call or I can set up a special on line order page for you, which ever you prefer. Unfinished Shaker Peg Racks and Solid Oak Cherry Maple. "It’s a beautiful house!" You exclaim this to your husband as the two of you walk through your brand new abode. Everything is perfect thanks to unique wood floors designed just for you. Something is missing, though. Where will you hang your coats? This beautiful house doesn’t have a closet. I know! You snap your fingers in a eureka moment, this is exactly what you need. You can stain or paint these yourself and they will match those floors perfectly. You can choose from different sizes and edge details. This way, you can create a design perfect for your space. It’s your first home and it’s absolutely beautiful. Now, all you need to do is get started finishing your perfect piece.